Tomorrow brings glitter! Glitter Friday if you will. I think that should be something on the official calendars. Glitter Fridays. Tomorrow's swatches will be coming to you from A Rhyming Dictionary. Go check it out now, but wait till you see the colors I have for you tomorrow. For today, I'll show you one with some nail art. This is Hip-Hopper. Come back tomorrow for more! I'm all for glitter Friday's being official! Not that I need an excuse to try to work it in to all of my manicures! I wish I had the time to do my nails everyday... I have so many ideas! This is just great! :) love everything about it. Adorable mani! I can't wait to see the Rhyming Dictionary polishes! 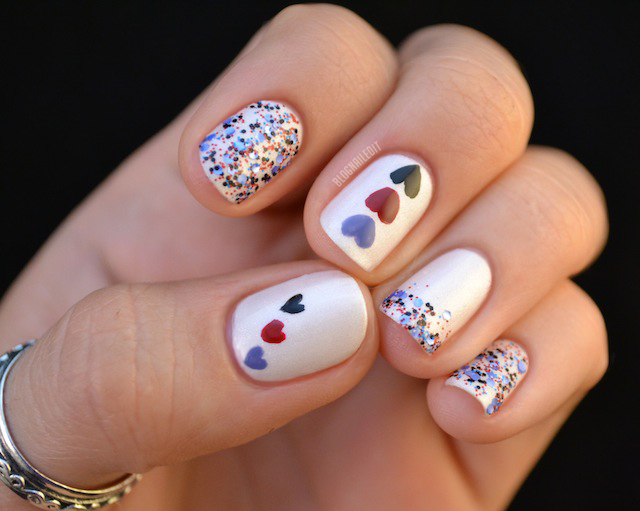 This design is simple but so cute.